Not all rock and mineral information is scientifically-focused – in fact, the world of rocks and minerals has a rich and interesting history, full of fun facts and tidbits. And, you might find some anecdotal rock and mineral information quite surprising! To start, rocks and minerals are not quite the same thing. Minerals are inorganic substances which exist naturally on earth. They are made up of 92 different elements, which create many different combinations. Some minerals are made of only one element (such as gold, or silver), but most are a combination of two or more elements (such as quartz, which is formed when silicon and oxygen combine). Rock, on the other hand, is formed from a combination of two or more different minerals. A good example of this granite (which contains the minerals quartz, feldspar, and mica). Many sources of rock and mineral information provide in-depth scientific analysis and details – but that's just the beginning! Below, we've put together a few lesser-known facts, to demonstrate the wealth of information and unusual facts an interest in rockhounding can turn up! According to mindat.org, approximately 5,000 species of minerals have been identified – but less than 100 of these are commonly found in earth's crust. Minerals are always solid, with a repetitive crystalline structure that forms distinctive geometric shapes, which vary between species. The size of a mineral's crystals is largely determined by the cooling process of magma in the area in which they are formed; when magma cools quickly, smaller crystals are formed, while slow cooling produces larger crystals. Gold is an elemental mineral which is also considered a precious metal. In pure form, it is so soft that it can be shaped by hand. In fact, an ounce of pure gold (roughly the size of a matchbox) can be flattened into a sheet the size of a tennis court, or stretched to create a wire 50 miles long. 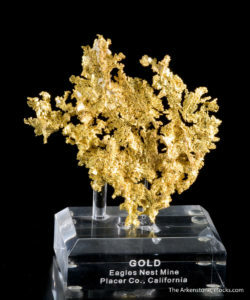 The largest pure nugget of gold was discovered in 1869, in Australia, and weighed in at approximately 156 pounds – enough to create a gold sheet larger than four football fields, or a wire which could wrap the circumference of earth approximately 5 times! The color blue has long been associated with royalty, which historically created a high demand for blue stones and gems, such as lapis lazul and turquoise. The use of these stones in jewelry has dated back as far as 5000BC – but did you know that lapis lazul was also ground into powder, for use as eyeshadow by the ancient Egyptians? Jade is not just a beautiful precious stone – it is also extremely strong, which made it ideal for it's most common historical use: creating tools such as knives, hooks, axes, and hammers. Many of the colorful gemstones we know and prize are actually related minerals – for example, watery blue Aquamarines and deep green Emeralds are both beryls. And blood red Rubies and brilliant blue Sapphires are actually both corundum, a crystalline form of aluminum oxide. Variation in color between crystals of the same species is actually very common, is caused by either impurities within the crystals themselves, or exposure to other mineral substances during their formation. Mercury is liquid at room temperature, and has the lowest boiling point of any other metal. It can also be used to dissolve other metals, such as gold or silver. Though they are both made from carbon, graphite is one of the softest minerals, while diamond is the hardest. In fact, diamonds have long been used to cut and drill other materials – in 300 BCE, they were already being used In India to engrave other precious gemstones. Diamond crystal are so durable, they will not even dissolve in acid – they can only be ground down by other diamonds, or destroyed in intense heat. The gemstone Garnet gained its name because it resembled the juicy red seeds of a pomegranate. Pumice is a very light rock – in fact, its name is derived from the Latin word pumex, meaning foam. Pumice is the only rock that floats – though its sponge-like texture will absorb water until it eventually becomes saturated with liquid, and sinks. Interested in reading more fascinating rock and mineral information? Check out the Wisdom Pocket blog, to learn more – or contact the experts at iRocks, today!